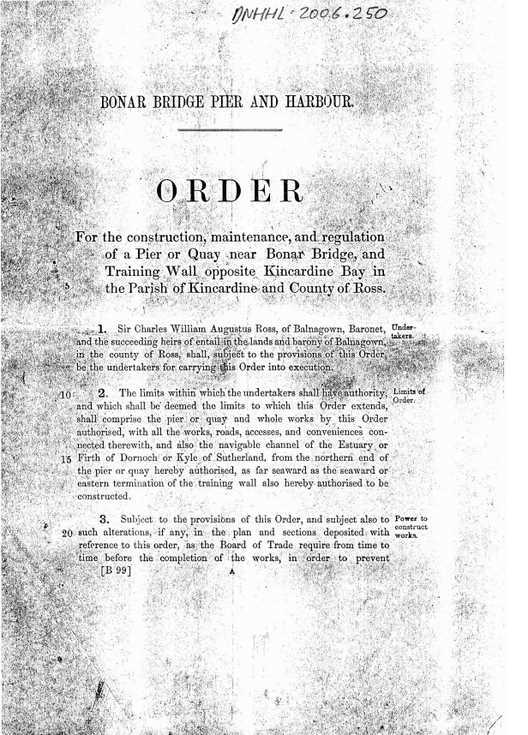 Photocopy of an Order by the Board of Trade for the construction, maintenance and regulation of a pier or quay near Bonar Bridge. The Order may be cited as 'The Bonar Bridge Pier and Harbour Order 1877'. Sir Charles Ross of Balnagowan is the nominated undertaker for the work. 15 pages giving details of work, lists of materials required, with prices and rates to be charged for using the pier for vessels, animals, fish and goods.